This is the year that Wizards of the Coast goes really big. They are in the midst of launching the next edition of Dungeons & Dragons and to tie-in with that they are releasing a series of linked novels that tell of how all the changes to the D&D settings, such as the Forgotten Realms, end up happening. Each book is written by Wizards’ top talent and links to existing series. Bob Salvatore’s The Companions is the first tale of The Sundering and it is also the latest novel in Dark Elf Drizzt Do’Urden’s epic saga that has lasted for a great number of novels. Paul S. Kemp’s latest, The Godborn, is the second book in The Sundering and it is also the latest in his Erevis Cale series that has lasted for seven novels thus far and doesn’t look like its going to stop anytime soon. I read the novel last month and it proved to be just as damn good a read as the previous two trilogies. There were a lot of plot threads left open at the end of the Twilight War trilogy, even as Paul provided a very satisfying, but emotional, conclusion. With the new novel, he addresses many of them and creates yet more mysteries, maintaining a healthy balance between the two. Being the eighth novel in the saga of Erevis Cale, the Chosen of Mask (the God of shadows and thieves), it is hard to talk about events herein without referring to events that have already happened in the series. There are a lot of momentous things that have already happened and now they all come to a head as the Realms begin to tear themselves apart, as all the gods make their play for the event that will be known down the ages as the Sundering. The Godborn deals with Vasen Cale, the son of Erevis and Varra. At the end of Shadowrealm, the third Twilight War novel, we knew that Varra had been spirited away by Mask as a favour to Erevis so that she could survive the events of the Cycle of Night, the great apocalyptic event that would ensure the ascendance of Shar, the Goddess of loss and the night. That’s where we find ourselves when the novel begins. To keep Varra safe and to make his own move for the Sundering, Mask brought her several decades forward in time and gave her in to the care of the followers of Amaunator, formerly known as Lathandar, the God of the dawn and hope. Varra passes in childbirth but the boy is raised by Lathander’s followers and grows up to be one of them, enjoying high station in the out-of-way monastery. However, much as with Paul’s other Erevis Cale novels, Vasen isn’t the sole POV character, not by a long shot. We also get to see some extensive scenes from returning characters like Riven, Rivalen, Mephistopheles and Magadon too. And much joy was had. Riven is one of my favourite characters in the entire series and its great to see him return for another outing. He is older, more grizzled, more tired, and more ready to just end everything. Along with Erevis, he was marked by Mask as his Chosen, and in the absence of his friend he has soldiered on for nearly a century. He’s had to shoulder all the responsibilities of being the Chosen of Mask by himself for all that time. He has felt incomplete and he has been buried under those expectations. When he finds about Vasen, he sees a sign from Mask and he ensures that Erevis’ child grows up to be worthy of his father’s legacy. Through the entire novel, these are the kinds of things we see from him. When I first met Riven in the Erevis Cale Trilogy, he was Erevis’ bitter rival. Since then he’s grown to be Erevis’ most steadfast friend, a true friend, the kind that is rare to see. And he’s been loyal. This comes to an incredibly satisfying conclusion later on in the novel when Riven and Vasen go to visit Mephistopheles and set things right as they should be, as Mask decrees it. I was waiting for that to happen all through, and when it happened, I couldn’t really stop myself from jumping up and down in glee. Come on, it was expected, it had to happen, and it was all glorious. Glorious. Rivalen proved to be a very different character this time around. He’s completely lost in his service to Shar and there isn’t any depth that he will not go to in order to further his Goddess’ plans. The Godborn marks his further descent. Its fascinating to see him since his situation is extremely complicated. There are things that he did in his past that put him at odds with his brother, and even with his father. There are familial complications involved here that directly affect Rivalen and in many ways these complicated prove to be his undoing. Watching that entire debacle unfold was one of the most satisfying experiences in the novel. And finally we have Magadon, the half-breed son of Mephistopheles, the Archduke of Cania, the Lord of the Eighth. Magadon has always struggled with his devilish heritage and his father has made him a pawn in his vendetta against Asmodeus, the Lord of the Nine Hells who is also a god, but this time it is Mags who gets the one-up. His father made him suffer during the events of Twilight War, and the mind-mage finally gets his revenge on his father, in the best way possible. Another air-pumping moment. Throughout the novel, we continue to see how each of these characters, and more besides, continue to develop. They are the heroes of sorts that define the other struggles taking place across the Realms. For Vasen it all comes down to acknowledging his heritage. Since he was conceived during Erevis’ tenure as a Chosen of Mask, having already undergone the transformation process that turned him into someone akin to one of the Shadover with his entire body made out of the stuff of shadows, Vasen is very much the same. This marks him out from the very beginning and is just one of the many things that the young man has to accept. For Riven, it all comes down to acknowledging that his entire service to Mask has indeed been something to be regarded highly. He just has to take that final step. For Rivalen and Mephistopheles, it is all about fulfilling their devious plans and becoming supreme within their spheres of influence. That’s what it all comes down to. The action in the book is grander than it has been throughout the entire series. Everything is on a whole different scale. Paul’s action choreography is one of the reasons why I love to read his novels since he writes them extremely well and The Godborn is no exception to that. They are always packed with tons of excitement and anticipation, with things able to go either way. Of course, since this book is also a part of The Sundering, we need to see some references to that event happening. Curiously, much as with Bob Salvatore’s The Companions we don’t really see all that much, aside from references as to how the Shadovar are collecting an entire group of potential Chosen since their leaders are seeing signs that some monumental changes are on the horizon and they want to be kept abreast of it all, they want to be able to understand what’s happening as it all comes about. In hindsight, I can tell you that it isn’t until Erin M. Evans’ The Adversary, the third Brimstone Angels novel from the author and the next book in this event series that we really get to see more of that aspect of this entire event. So that was the only downside to The Godborn. I didn’t really learn anything about the big event. Other than all of that, this book proved to be just as excellent as Paul’s previous novels in the series. The incredible scope of his novels always exposes so many different sides of the Realms and that’s one of the best things about his writing. He writes to surprise you, amaze you and just in general show off the incredible diversity of the Realms. As a relative new reader to the setting, this is an approach that works extremely well for me. More Erevis Cale: Erevis Cale Trilogy, Twilight War Trilogy. 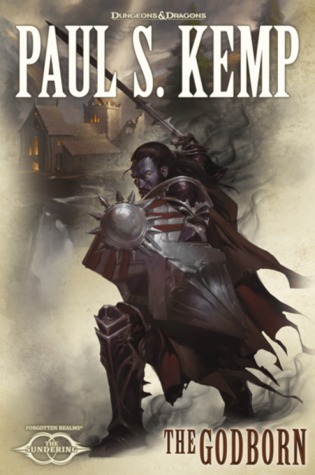 Posted on November 23, 2013, in Book Reviews, Review Central and tagged Book Review, Cycle of Night, Demons, Devils, Drasek Riven, Epic Fantasy, Erevis Cale, Fantasy, Forgotten Realms, Gods, magic, Mask, Paul S. Kemp, Review, Review Central, Shadovar, Shar, The Sundering, Vasen Cale, Wizards of the Coast. Bookmark the permalink. 5 Comments.